From Auckland to Christchurch, discover the dramatic landscape of New Zealand. Highlights include the Bay of Islands, Queenstown & a Milford Sound Cruise. A place of wild beauty and extraordinary friendliness, New Zealand is somewhere you’ll love taking your time getting to know over 24 days of wonder. After falling in love with the ‘City of Sails’, Auckland you’ll discover ancient kauri forests and the spectacular beauty and historical significance of the Bay of Islands. Explore ‘Middle Earth’ before taking in the geothermal wonders of Rotorua. Continue with a visit to Wellington before hopping on a ferry to the South Island. Sample crisp Sauvignon Blanc in its place of origin, marvel at the diverse marine life along the East Coast before arriving in Christchurch. This city will delight with its resilience and positive outlook before you take one of the world’s great train journeys – the TranzAlpine. The Franz Josef Glacier is a highlight, as is the energy and passion of Queenstown. Milford Sound is simply breathtaking and waking up to the view of Mount Cook will be a treasured memory for years to come. This morning discover Waitangi Treaty Grounds with a Ma ori guide. Be entertained by an authentic Maori cultural performance inside the beautifully carved meeting house. Return to your hotel in Auckland for an overnight stay. Visit the Hobbiton movie set before arriving in Rotorua, home of Maori culture and bubbling mud pools, for a two night stay. Be amazed by Rotorua’s geothermal activity during a visit to Te Puia. Witness a sheep show, take an amphibious duck tour or relax in the geothermal pools. Alternatively, enjoy the view from Skyline Rotorua while wine tasting. Optional Flight - Take a flight to Mt Tarawera including a volcanic landing. (Additional expense). Witness the force of nature at Huka Falls before cruising magnificent Lake Taupo. Enjoy your overnight stay in the home of Art Deco, Napier. Meet the makers at a special wine tasting and dinner at Mission Estate Winery. Take a walking tour of Napier’s Art Deco buildings, view the famous landmarks of Napier during a vintage car tour or discover a diverse range of aquatic animals and wildlife at the National Aquarium. Continue to Wellington for a two night stay. Explore Wellington’s sights on your city tour before visiting the National Museum of New Zealand, Te Papa. Take an in-depth journey of Te Papa to discover the treasures and stories of New Zealand, told with authority and passion. Concludes with kapu ti – a hot drink and traditionally inspired food. Travel in the premium lounge on the ferry across the Marlborough Sounds to the South Island. Enjoy a tasting at the home of Sauvignon Blanc or visit Omaka Aviation Heritage Centre. Drive along the spectacular East Coast where rugged mountains meet the ocean. At Kaikoura discover the diverse marine life. Experience how Christchurch is recovering during your two night stay. Go punting on the River Avon, take the Botanic Gardens Tour or enjoy an open top bus ride around Christchurch. Alternatively, visit the seaside town of Akaroa or the International Antarctic Centre. Experience a Kiwi home-hosted dinner with a local family or enjoy dinner at the hotel’s restaurant. Join the TranzAlpine this morning for your rail journey across the Southern Alps. Stand in wonder at Franz Josef Glacier with its ever-changing face before your overnight Special Stay. Enjoy a ride on the Haast River Jet boat before you arrive in Queenstown for your three night stay. Take the Dart River Wilderness Jet, or tour local wineries. Alternatively, feel exhilarated on the Shotover jet, a 4WD Skippers Canyon, or Safari of the Scenes tour exploring The Lord of The Rings filming locations. Take a steamship cruise on TSS Earnslaw and enjoy dinner at Walter Peak, ride the Skyline Gondola and dine overlooking Queenstown, or simply relax at the hotel’s restaurant. A free day to discover Queenstown. In the darkness of the Te Anau caves, see the shimmer of thousands of glowworms. Enjoy an overnight Special Stay on board the Milford Mariner amidst the majesty of Milford Sound. Awake to breathtaking beauty in Milford Sound. Then immerse yourself in New Zealand’s oldest university city, Dunedin, with a two night stay. Choose between Speight’s Brewery, Etrusco and the hotel’s Carlton Restaurant. Tour Larnach Castle or visit the breeding colony of Royal Albatross. 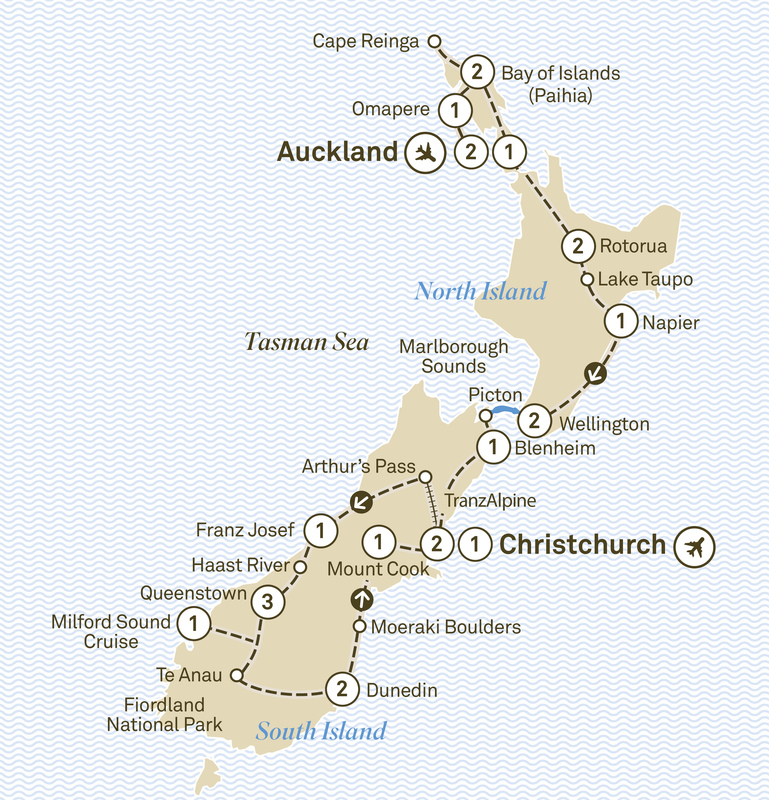 Alternatively, cruise Otago Harbour or take the scenic Taieri Gorge Railway. Visit the Moeraki Boulders, a unique sight featuring huge spherical boulders scattered across a sandy beach. Enjoy a Special Stay at your hotel with Mount Cook view rooms. Visit the Church of the Good Shepherd before arriving back in Christchurch for your overnight stay. Celebrate your adventures during an iconic tram ride and farewell dinner. Bid farewell to wonderful New Zealand. New Zealand's South Island is full of grand vistas and shimmering waters, with a 12 day luxury tour visit Queenstown, Franz Josef, Milford Sounds & more.